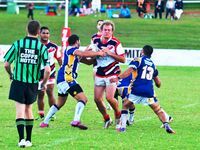 Nambucca Heads is hoping Sunday's Group 2 grand final will be a case of third time's a charm after losing the title deciders in 2011 and 2012. THE Roosters have had a chequered passage into the biggest game of the year. Before a ball was kicked in anger, almost every league fan surveyed tipped the runners-up from 2011-12 to be one of the sides to be involved in the big one. But a young side took time to find its way and there were some unforseen stumbles. 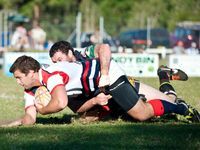 On the credit side of the ledger, on May 26 Nambucca became the only side to lower Coffs Harbour's colours. Battle-hardened from three sudden death matches in a row, co-coach Bert Gray has been saying since a loss to the Comets on July 21 that his men will the last ones standing on grand final day. The answer is just a couple of sleeps away.